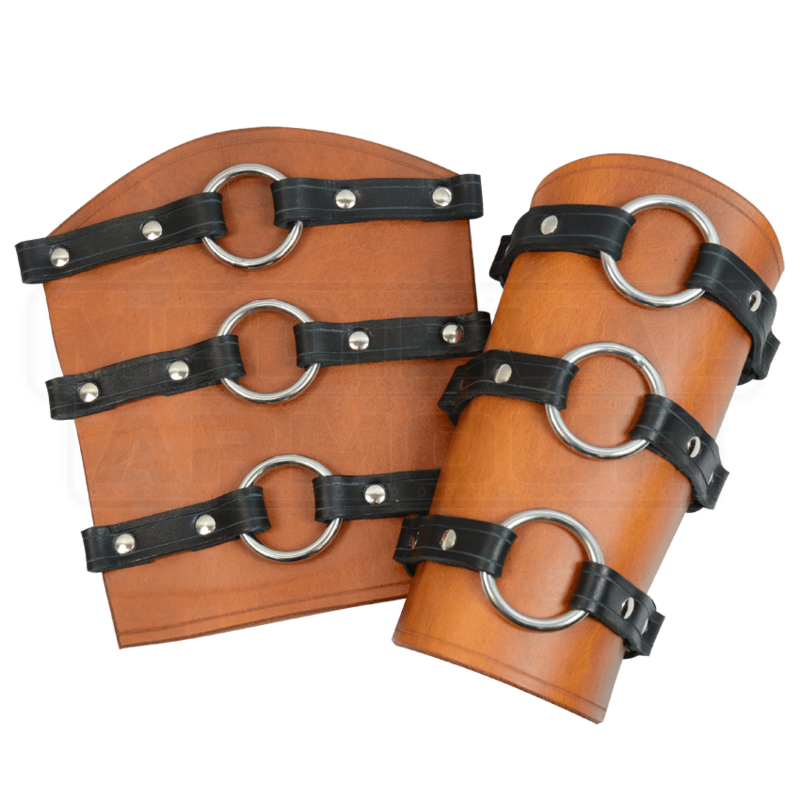 These hand made leather arm bracers are crafted from the finest quality 13/15 ounce leather and accented with three steel O-rings, not only for looks, but for added protection. No sword will be cutting through these rings. The rings are secured to the bracers by black 3/4 inch leather straps. The leather straps form a loop at the edge of the bracer, thus creating the method in which these bracers close, we call them leather speed lacers. Speed lacers are pretty easy to secure by yourself, and once they are on, they provide quite a comfortable fit. Two long leather laces are included. These bracers are sold as a pair. Select the color you would like for the arm bracers, the straps will always be black. The bracers look great but they arrived flat. This isn't too big of a deal, but they were pretty ridged and took some effort to wrap around my arm. I've tied them and left them to sit and get more used to a cylinder shape. They're fine bracers, but I wasn't stoked at their ease of use.